[This text is a shortened version of Hauser, Jens: Chatarra dura, política suave y máquinas mojadas: Hacia un humano innecesario / Hard Scrap, Soft Politics, and Wet Machines: Toward an Unnecessary Human. In: Esparza, Gilberto (ed. ): Cultivos. Mexico, Consejo Nacional para la Cultura y las Artes, 2015; p. 323-347. Since the earliest anthropomorphic statues, myths of vivification surround artefacts made by the artist’s hand. The animation of malleable matter stands in a long pictorial tradition, and, in technical terms, the automata of the eighteenth century and twentieth century robotic art can be seen in this vein. Beginning in the nineteenth century, biological metaphors are employed in the discussion of the artwork itself as an organism3). In human’s cultural history, art has imagined, represented and mimicked, then simulated and – quite recently – manipulated and presented living systems for real. After painting, sculpture and automata, art in the late 20th century has then first employed “dry” informatics and robotics to stage aliveness, and, more recently, “wet” cell and molecular biology. But which are the adequate media to re/present, simulate or animate biological systems today, and how do artistic strategies correspond to the epistemological context of their time? This question has provoked a real contemporary paragone: On the one side, advocates of the animation of the technological have favoured robots with lifelike behaviour, visualized computer simulations of evolutionary processes, ecological systems and genetic algorithms; on the other, proponents of the technologization of the animated have focussed on interventions in carbon-based biology, including transgenics, the synthesis of DNA sequences, cell and tissue engineering, developmental biology, self-experimentation, or the aesthetic use or re-contextualization of model organisms from the lab. Within this tension field, it is worth to have a closer look at Mexican artist Gilberto Esparza’s artwork of the last decade, because it is indicative of a – still rare, but epistemologically significant – tendency to bridge this dichotomy between the animation of the technological and the technologization of the animated. While employing software, hardware and wetware all together, the appearance of Esparza’s artistic creatures is all but anthropomorphic – they rather combine bacteria, plants and robots: hybrid entities that seem to pave the way toward an unnecessary human. For example, Esparza’s Plantas nómadas [Nomadic Plants] scrape their existence as expressly symbiotic hybrid creatures: conceived as autonomous robotic ecosystems containing autochthonous bacteria in microbial fuel cells and—thanks to their energy production—suddenly motile plants, they not only combine hardware, software, and wetware to purify polluted water, filter out chemicals and heavy metals, release oxygen and generate energy but become self-sufficient in the process. Their eco-systemic interaction enables them to compensate and overcome their innate biological limitations. Esparza’s newly conceived Plantas autofotosintéticas [Autophotosynthetic Plants] use the energy extracted from wastewater to produce even the light the plants require to conduct photosynthesis, making them independent from natural light sources. These works harbour an equally poetic and philosophical paradox: they are themselves human technological constructs and, as such, point to the destructive, polluting character thereof, while, at the same time, they interlace with natural processes, evolving through technology into symbiotic ecosystems to become independent of their creator—who is ultimately dispensable. 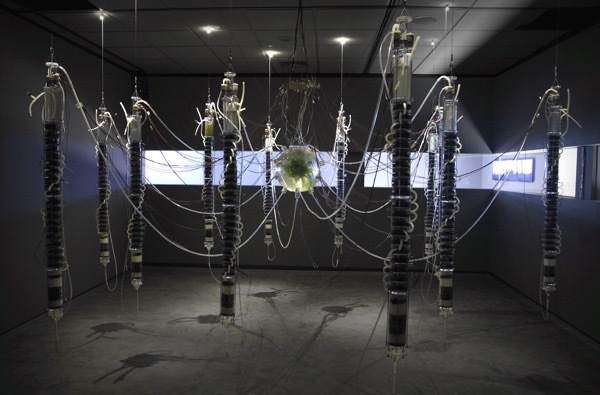 Gilberto Esparza’s art is symptomatic of an epoch in which cultural practitioners interested in natural science and technology no longer merely comment from an allegedly critical distance on the political and environmental consequences of the convergence technologies that transform our living space. Instead, they test their dynamic first-hand and push for their democratization. And since such technologies and their induced processes tend to exceed our phenomenological scope, both Esparza’s Plantas nómadas and Plantas autofotosintéticas aim at generating system awareness for the invisibility of the microscopic and the incomprehensibility of the macroscopic —because we may have not yet understood that “living machines” today operate on scales very different from the mechanical, electronic, and computational ones we know and can identify. Instead, with the advent of disciplines such as synthetic biology, “machines” may largely reproduce, proliferate, and become pervasive while being largely unidentifiable. Today, living machines are neither mere imitations or simulations in non-organic materialities, nor are human qualities necessarily the centre of attention. If, then, Gilberto Esparza’s Plantas nómadas are said to express autonomous and intelligent behaviour, the latter might not be meant to describe the mimicking of human cognition, but rather the system’s decentralized and collaborative intelligence to clean up humankind’s mess in times of major ecological and atmospheric crises! In this sense, the hybrid and, somehow literally, living machines conceived in Gilberto Esparza’s post-anthropocentric universe are, indeed, related to the ever-recurring historical fascination of staging aliveness in cultural history. Esparza’s strategies to employ bacteria and plants as “workhorses” to hook up with hard physics and electronics are indicative of this new generation of artists who combine, rather than confront, the aforementioned complementary approaches that have historically coexisted: on the one hand, the animation of the technological4) —which means the construction and staging of lifelike processes or entities in other than biological media, and, on the other, the technologization of the animate—which implies the instrumentalization or manipulation of existing organic systems, beings, or their constitutive parts. Against the grain of ever more sophisticated and accelerated, purposeful human engineering, Gilberto Esparza’s artistic practice avoids the use of engineered organisms, drawing instead on their ‘natural technical’ capacities and sympathizing with the poetry of bricolage. The Plantas nómadas may well each purify half a litre of water every two weeks—but their main purpose is to raise awareness, not productivity. In this light, it remains to imagine how Esparza’s Plantas nómadas and Plantas autofotosintéticas will become more independent in until now unimaginable biosemiotic9) – and potentially, post-anthropocentric – cycles. Howsoever they perish, flourish, or mutate, Esparza breaks with the anthropocentric posture to conceive of his wetware robots to carry out useful tasks simply for our own species. Hauser, Jens: ‚Ebenbildhauerei/Similisculpting.’ In: Wellmann, Marc (ed. ): BIOS – Konzepte des Lebens in der zeitgenössischen Skulptur/ Concepts of Life in Contemporary Sculpture. Berlin/Köln, Wienand Verlag, 2012; p. 20-29. Jens Hauser is a Paris and Copenhagen based art curator and writer. As a media studies scholar he is focusing on the interactions between art and technology. He holds a dual research position at both the Department of Arts and Cultural Studies and at the Medical Museion/Faculty of Health Sciences at the University of Copenhagen, and is a distinguished affiliated faculty member of the Department of Art, Art History and Design at Michigan State University. His curated exhibitions include L’Art Biotech (Nantes, 2003), Still, Living (Perth, 2007), sk-interfaces (Liverpool, 2008/Luxembourg, 2009), the Article Biennale (Stavanger, 2008), Transbiotics (Riga 2010), Fingerprints… (Berlin, 2011/Munich/2012), synth-ethic (Vienna, 2011), and assemble | standard | minimal (Berlin, 2015). Hauser is also a founding collaborator of the European culture channel ARTE and has produced numerous reportages and radio features.